A depressant, or central depressant, is a drug that lowers neurotransmission levels, which is to depress or reduce arousal or stimulation, in various areas of the brain. Depressants are also occasionally referred to as "downers" as they lower the level of arousal when taken. Stimulants or "uppers" increase mental and/or physical function, hence the opposite drug class of depressants is stimulants, not antidepressants. Depressants are widely used throughout the world as prescription medicines and as illicit substances. Alcohol is a very prominent depressant. Alcohol can be and is more likely to be a large problem among teenagers and young adults. When depressants are used, effects often include ataxia, anxiolysis, pain relief, sedation or somnolence, and cognitive/memory impairment, as well as in some instances euphoria, dissociation, muscle relaxation, lowered blood pressure or heart rate, respiratory depression, and anticonvulsant effects, and even complete anesthesia or death at high doses. Cannabis may sometimes be considered a depressant. THC may slow brain function to a small degree, while reducing reaction to stimuli. Cannabis may also treat insomnia, anxiety and muscle spasms similar to other depressive drugs. 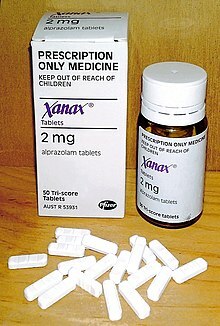 Other depressants can include drugs like xanax and a number of opiates. The most common way to measure intoxication for legal or medical purposes is through blood alcohol content (also called blood alcohol concentration or blood alcohol level). 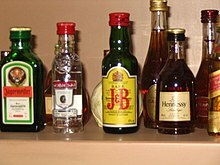 It is usually expressed as a percentage of alcohol in the blood in units of mass of alcohol per volume of blood, or mass of alcohol per mass of blood, depending on the country. For instance, in North America a blood alcohol content of "0.10" or more correctly 0.10 g/dL means that there are 0.10 g of alcohol for every dL of blood (i.e., mass per volume is used there). A benzodiazepine (sometimes colloquially "benzo"; often abbreviated "BZD") is a drug whose core chemical structure is the fusion of a benzene ring and a diazepine ring. The first such drug, chlordiazepoxide (Librium), was discovered accidentally by Leo Sternbach in 1955, and made available in 1960 by Hoffmann–La Roche, which has also marketed the benzodiazepine diazepam (Valium) since 1963. Benzodiazepines enhance the effect of the neurotransmitter gamma-aminobutyric acid (GABA) at the GABAA receptor, resulting in sedative, hypnotic (sleep-inducing), anxiolytic (anti-anxiety), anticonvulsant, and muscle relaxant properties; also seen in the applied pharmacology of high doses of many shorter-acting benzodiazepines are amnesic-dissociative actions. These properties make benzodiazepines useful in treating anxiety, insomnia, agitation, seizures, muscle spasms, alcohol withdrawal and as a premedication for medical or dental procedures. Benzodiazepines are categorized as either short-, intermediate-, or long-acting. Short- and intermediate-acting benzodiazepines are preferred for the treatment of insomnia; longer-acting benzodiazepines are recommended for the treatment of anxiety. Contrary to popular misconception, opioids are not depressants in the classical sense. They do produce central nervous system depression, however, they also excite certain areas of the central nervous system. To remain true to the term 'depressant' – opioids cannot be classified as such. For opioid agonists and opium derivatives, these are classified differently. Analgesic or narcotic correctly identifies these drugs. However, they do have depressant actions nonetheless. Combining multiple depressants can be very dangerous because the central nervous system's depressive properties have been proposed to increase exponentially instead of linearly. This characteristic makes depressants a common choice for deliberate overdoses in the case of suicide. The use of alcohol or benzodiazepines along with the usual dose of heroin is often the cause of overdose deaths in opiate addicts. ^ "Depressant - Definition". Princeton WordNet. Retrieved 28 December 2013. ^ "Minimum Legal Age Limits". IARD.org. International Alliance for Responsible Drinking. Retrieved 23 June 2016. ^ Hájos, N.; Katona, I.; Naiem, S. S.; Mackie, K.; Ledent, C.; Mody, I.; Freund, T. F. (2000). "Cannabinoids inhibit hippocampal GABAergic transmission and network oscillations". European Journal of Neuroscience. 12 (9): 3239–3249. doi:10.1046/j.1460-9568.2000.00217.x. PMID 10998107.